Cuff Pressure Gauge is a manometer based gauge to measure the pressure in the Centimeter of Water cm.H2o. Tracheal tubes with high volume low-pressure cuffs and laryngeal tubes. The vacuum valve used for deflation of low-pressure cuffs. The used in combination with High Volume Low-Pressure Cuffs can reduce micro-aspiration. It prevents VAP from occurring in the first place. The devices reduce the risk of pressure necrosis and mucosal ischemia. They help to prevent the risk of aspiration which can lead to the possibility of pneumonia. The analog system with no dependence on any energy source makes the cuff pressure gauges highly reliable under any circumstances (outdoor, transport, OR). The accuracy of the display as well as the pre-defined pressure ranges help users to maintain the correct pressure. 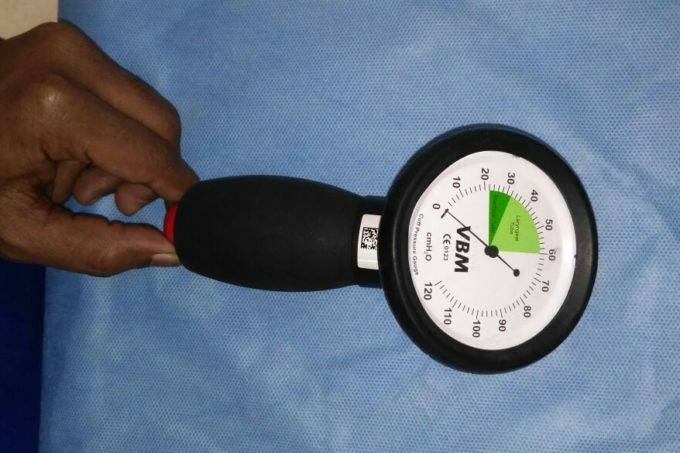 Cuff pressure gauges established as a standard device in many clinical institutions. More societies of anaesthesiology and intensive care throughout the world are endorsing the systematic control of cuff pressure in the recommendation of their guidelines. hospital costs and length of stay. A leading cause of VAP is micro-aspiration of potentially infectious secretions through microchannels. Cuff pressure management can contribute to reducing tracheal ischemia and subsequent complications. Availability of the device and precision of the measurement are fundamental to the success of treatments. As the inventor of the cuff manometer, Cuff pressure monitor is committed to driving the development of hospitals. In developing new cuff pressure gauges follows three main principles: Reliability, accuracy, and ease of use. According to the pediatric and adult for OR, pre-hospital and ICU environment.